A sense of sadness and gloom permeated the Lakers, and that happened well before Dwight Howard rubbed it in their face with an endless charade of dunks, blocks and athleticism. Hours before their 134-108 loss Wednesday to the Houston Rockets became official, the Lakers learned they’d lose yet another key piece to their roster. And for once, it didn’t involve an injury. The Lakers traded Steve Blake to the Golden State Warriors for two young seldom-used point guards in Kent Bazemore and MarShon Brooks, the first sign of a white flag in the team’s effort to rebuild and trim salary. Blake learned about the deal shortly after participating in pre-game warmups. Soon enough, Blake dressed back into street clothes and shared farewells with teammates, coaches and team officials before departing the arena. That’s because Blake provided everything that D’Antoni wants in his system. Blake relentlessly provides energy, hustling for looseballs, setting up teammates on pick-and-rolls and making outside shots with dependable accuracy. Despite appearing in only 27 games because of a hyperextended right elbow, Blake posted a dependable 9.5 points and 7.6 assists. His four-year career with the Lakers entailed some tough moments, though. Blake admittedly felt tentative his first two years with the Lakers under Phil Jackson and Mike Brown in part because of their offense and adjusting to Kobe Bryant. He also had a slew of ailments. Blake suffered chicken pox in the first round of the 2011 NBA playoffs. He sat out for 13 games the following season because of a fractured rib. Blake missed a combined 36 games last year because of overlapping injuries in his abdominal muscle and groins. But Blake provided some signature moments, such as a 19-point effort in Game 7 of the Lakers’ first-round series win over the Denver Nuggets in 2012 and a game-winning 3-pointer in Houston in November in the Lakers’ first game against Howard since he left the team. What will the Lakers miss the most? This happened because the Lakers are well aware of their doomed playoff fortunes this season. The move allowed them to save a $4 million in combined salary and luxury taxes. It’s possible Bazermore and/or Brooks could develop at a relatively cheaper price. But for a team that’s ailing so much with an injury-depleted backcourt, Blake’s departure provided one huge dent. Can the Lakers no longer attract high-level free agents? 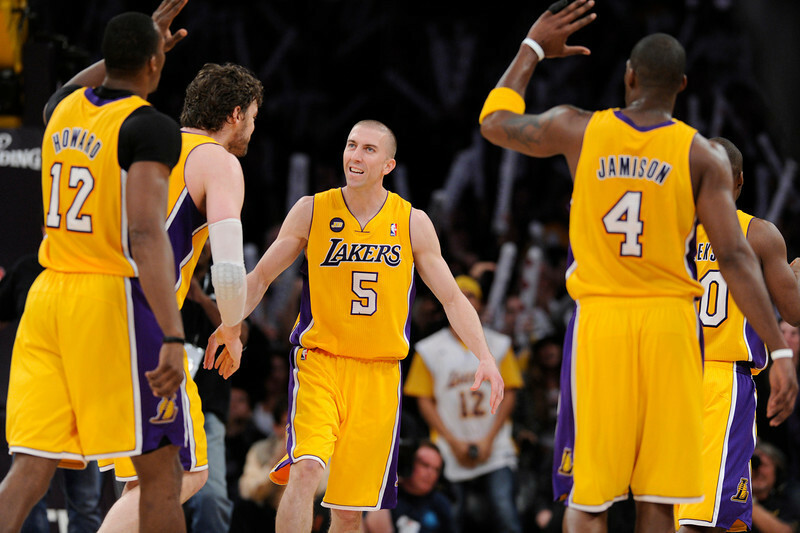 This entry was posted in Steve Blake by Mark Medina. Bookmark the permalink.